URBANA, Ill. - The University of Illinois main quad will be a stop on a nationwide tour of Hunger U – a mobile exhibit to raise awareness of nutrition and food security issues. 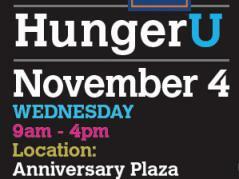 Hunger U will be stationed on the north end of the quad (south side of the Illini Union) on Wednesday, Nov. 4, from 9 a.m. to 4 p.m. Visitors can pedal tractors around the quad and participate in events to win prizes. The interactive games and displays provide information about the significance of modern agriculture and how it affects the world’s food crisis and the state of food security in over 100 countries. Lulu Rodriguez, director of the Agricultural Communications Program under the joint auspices of the Colleges of ACES and Media, believes Hunger U’s visit will not only to spark conversations about how today’s farmers are helping feed a hungry world but will also educate about the critical role that modern agriculture plays every day in putting food on the table. “Advocating for agriculture or ‘ag-vocating’ through awareness campaigns is just one example of how agricultural communications can be applied. Hunger U is a prime example of Ag Comm in action,” she says. Agricultural communications is a specialization within the field of communications in which majors develop technical expertise and hone skills that enable them to communicate about increasingly complex issues related to food, agriculture, energy, the environment and natural resources and related policy. For more information about Hunger U, including a complete list of sponsors, visit http://www.hungeru.com. To learn more about the Agricultural Communications Program, visit http://agcomm.illinois.edu.